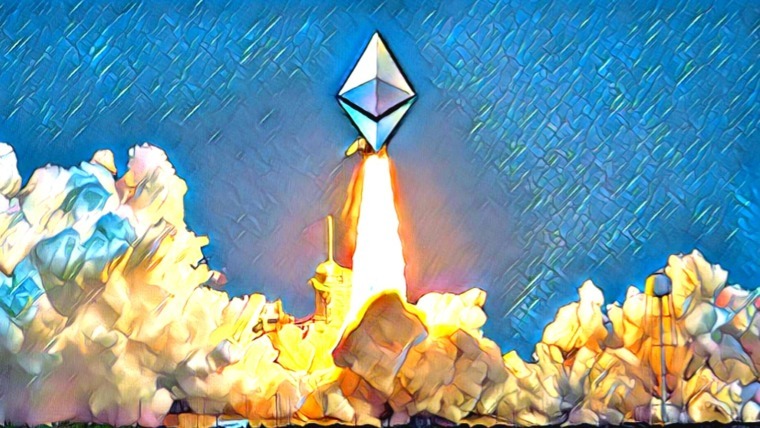 EOS has seen a significant plummet in price as the CTO announces his desire to begin working on a new project. The news caused holders to panic as price action plummeted below the $2.50 handle. Support moving forward; $2.26, $2.06, $2.00, $1.86, $1.64, $1.50, $1.32. 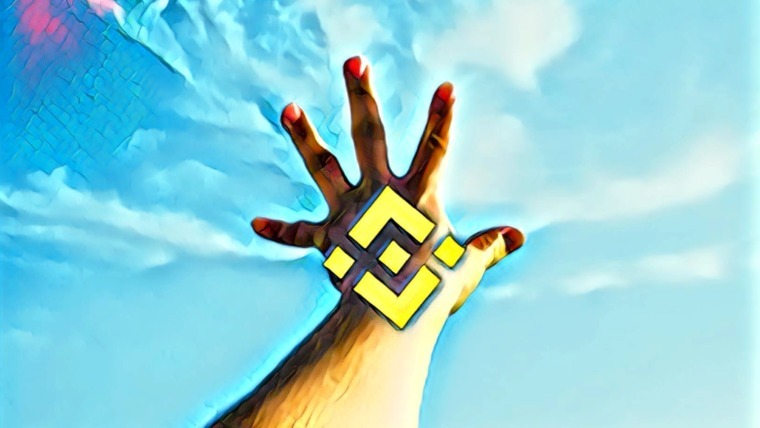 Over the past week, the confidence within the EOS community has taken a drastic knock as Daniel Larimer, CTO of Block.one, the development company behind EOS, took to Telegram to announce his ambition to create a new cryptocurrency project. The timing of the announcement could not have come at a worse time after the entire cryptocurrency industry was hit by extreme selling pressure when Bitcoin plummeted below $6,000 during mid-November 2018. Before the announcement, EOS had already undergone a drastic 52% decline from high to low in November 2018. However, after the announcement the market has continued to decline a further 32%, to where it is trading today at around $2.32. Larimer is no stranger to spearheading new cryptocurrency projects that make an impact. He had originally involved in BitShares, and had later moved on to the blockchain blogging platform, Steemit. Both of these projects have seen a great amount of success during their time. 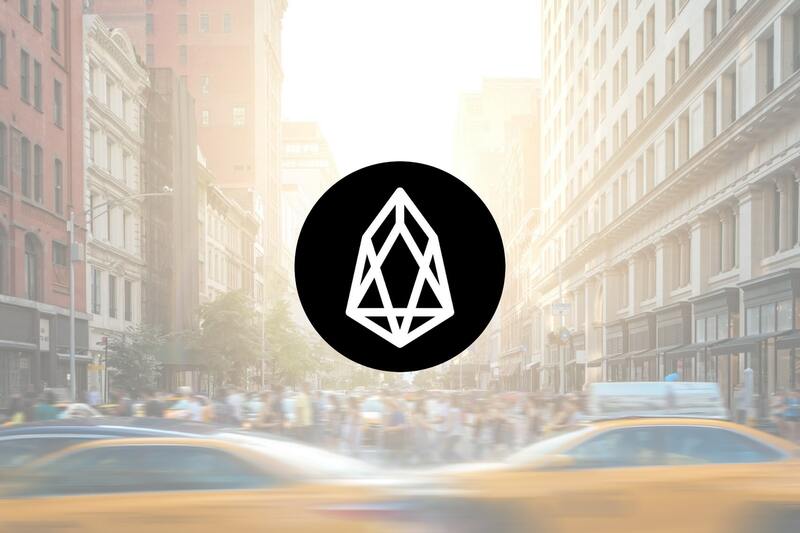 Despite the drop in sentiment toward EOS, the project continues to set records as it processed over 47.5 million transactions on December 3, 2018. Larimer had also tried to clear up the confusion to EOS investors as he took to Medium to clear up the “unintended consequences.” However, price action still reflects the fact that investors believe the CTO is moving on to a whole new project. EOS has seen a steep 9.88% price decline over the past 24 hours of trading as the cryptocurrency now trades at around $2.32, at the time of writing. 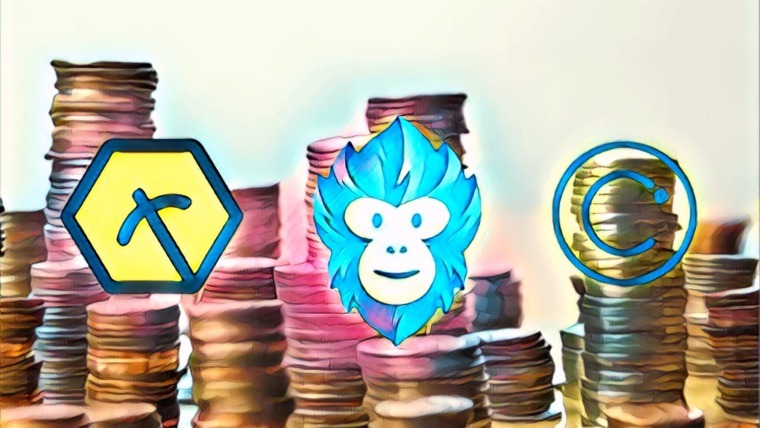 The EOS project has seen a further precipitous 28% price plummet over the previous 7 trading days, making it the worst performer in the top 20 cryptocurrencies in the stated period. The market drop has also caused EOS to drop to the 6th position in the market cap rankings. It currently holds a market cap value of $2.08 billion. Looking at the chart above, we can see the extent to which EOS has suffered over the past 35 trading days. The market had fallen from a high above $5.50 to a price below $2.50. The price drop looks like it will be continuing into the $2.00 region. We can see that price action has recently reached a support level provided by the long-term downside 1.414 Fibonacci Extension level (drawn in red) priced at $2.26. However, due to the corroding sentiment within the market, this support level is not expected to hold. Price action has dropped below $2.50 and looks like it is expected to drop further. Initial strong support below can be expected at the medium-term downside 1.272 Fibonacci Extension level (drawn in purple) priced at $2.06. What If EOS/USD Drops Below $2.00? If the market drops below the psychological round number support at $2.00, we can expect immediate support beneath to be located immediately at a short-term downside 1.414 Fibonacci Extension (drawn in green) priced at $1.86, followed by the medium-term downside 1.414 FIbonacci Extension level (drawn in purple) priced at $1.64. In the scenario that EOS/USD continues further below $1.64, we can then expect the next level of strong support to be located at the $1.50 handle, followed by the long-term downside 1.618 Fibonacci Extension level (drawn in red) priced at $1.32. 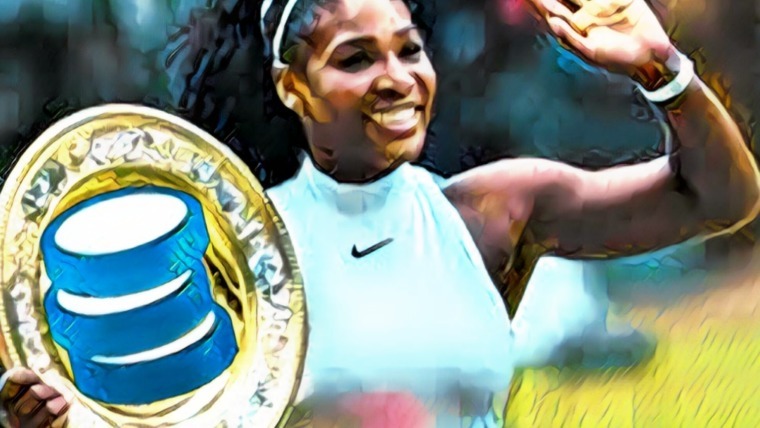 What If the Bulls Can Keep EOS/USD Above $2.00? If the buyers within the market decide to start buying at $2.00, we can expect EOS/USD to begin its long road to a recovery. 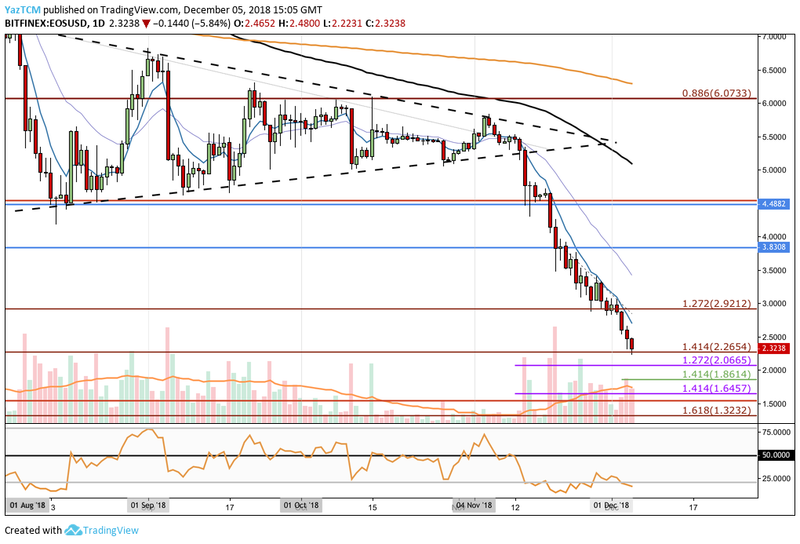 If we would like to see EOS/USD make a sustained recovery, we would need to see the market break above the $2.50 handle again and continue higher to tackle the $3.00 level. The RSI has remained in oversold conditions for over the past 2 weeks and there are no signs that the bears are running out of steam. This can lead us to the conclusion that there is still much more room for EOS/USD to travel lower. The first sign that the sellers are beginning to fade in momentum would be presented by the RSI climbing back above the oversold conditions at the 25 handle. Dan Larimer has alienated his community with his announcement, and this has been apparent in the market action for EOS. The charts are suggesting that there is still more damage to come for the market. We will be closely watching the $2.26 handle and the $2.00 handle to see if the bulls show any signs that they would like to defend these areas.